According to the Center for Disease Control and Prevention, a case of head lice is more of a nuisance than of real concern. The CDC notes that among children 3 to 11 years old, an estimated 6 to 12 million head lice infestations occur each year in the United States. So, don’t panic if you get the “dreaded lice letter” from your child’s school. There are all natural, non-toxic ways to get rid of a head lice infestation and to help prevent a repeat infestation. Lice Treatment Center™ products are formulated using natural, active ingredients and are a healthier alternative to other market brands that may contain amounts of insecticide. Every person in the home or anyone who has had physical contact with an infested person should be inspected for the presence of head lice or nits and then be treated. Apply LTC’s natural, non-toxic products to treat the infestation and to facilitate the removal of live lice and nits (lice eggs). Separate the hair into small sections and, using a stainless-steel lice comb, use a magnifier and light to inspect each hair strand and the scalp for live lice or their eggs (nits). Manually remove the bugs and nits strand. This meticulous combing and picking procedure usually takes from two to four hours, depending on the level of infestation and length of hair. The final step is applying the treatment oil to kill any remaining live bugs (nits cannot be killed and must be physically removed from the hair). This process must be repeated for about a week after initial treatment to ensure all nits and bugs are removed. 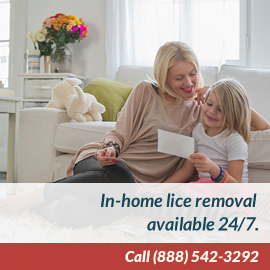 LTC technicians are available around-the-clock to answer your lice removal questions and to provide hands-on assistance. Call (888) LICE-AWAY or 888.542-3292. Since Lice are spread through head-to-head contact with someone who already has lice, teach your children to take precautions at school and during group sports or social activities. The need to be careful not to share pillows and sleeping bags. Wearing wigs and costumes at dress-up parties and school plays are also risks. Sports activities that involve sharing helmets such as baseball, lacrosse should be avoided unless they have their own helmets. Most of all, don’t share hats, scrunchies combs and brushes especially if your kid’s school has identified cases of lice. If your school has informed parents of active cases of lice, you may want to use some extra protection against exposure to lice. Lice Treatment Center’s Leave-in Hair Spray is an effective lice repellent. Spray your children’s hair daily, especially if they are going to participate in group activities. This product contains rosemary, tea tree and cinnamon essential oils, and are well-known lice repellents. My daughter-in-law has been using the spray daily on my youngest grandson for 5 years-- since pre-school. Knock-wood, his school.